Simply store and share your photos in one convenient place. Capture your favorite memories and keep them in Photobucket, where you can print, store, edit and share your favorite photos in a few easy clicks. Create photo gifts, wall art, prints and more with your favorite photos! * Free print offer valid for 25 free 4X6 matte or glossy prints per year. Must be processed in a single order using the coupon code delivered via email. 5GB of initial storage + an extra 8GB when you download the app. Stay connected to your most precious memories. Photobucket makes it easy to print, store, edit and share your photos on the go. BONUS! You’ll get even more storage space just for downloading the Photobucket app. Create custom photo canvas prints, blankets, phone cases and more with your favorite photos – great gifts for the holidays! 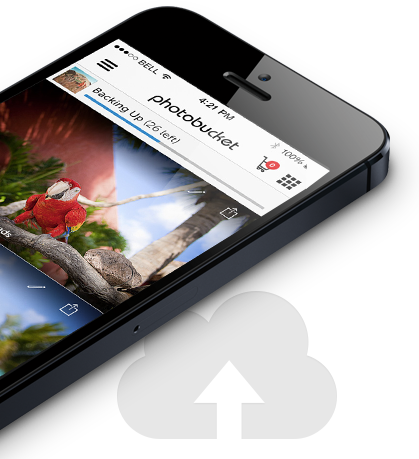 Get the Photobucket mobile app and keep your photos safe and organized anytime, anywhere. As a valued AOL member, you can rest easier with the knowledge that you're protected – online and off – with AOL's comprehensive suite of support and security features. Be sure to take advantage of all the valuable benefits that are part of your AOL membership – at no additional cost to you! Compatible with IE 10+, Safari 5.1.7+ and, latest versions of Chrome and Firefox web browsers. Supported operating systems include Windows Vista, Windows 7, Windows 8 and Mac 10.6+ on personal computers, and iOS 7+ and Android 2.3+ on mobile devices.